Tomorrow is Veteran’s Day. Today, though, I’m already saluting a veteran of the U.S. Army and the front lines of American music. I rarely hear an instrumental jazz album that affects me in a powerful, personal way. This Joe-Henry-produced record provided an automatic lift to my spirits every time I put it on this year. Either Toussaint and Henry have invented a new brand of jazz, or somebody needs to give me a name for what they’re doing so I can go find a whole lot more of it. It’s playful, soulful, surprising, and even funny. 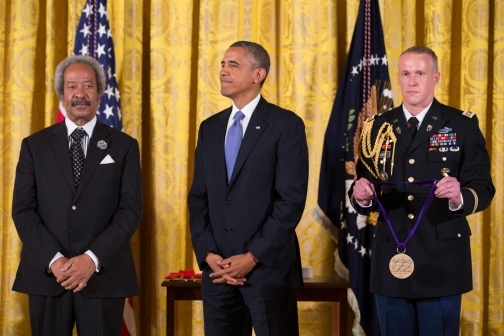 Allen Toussaint (left) receiving the Medal of Honor for the Arts from President Obama July 10, 2013, at the White House. Since then, The Bright Mississippi has been the instrumental album I have turned to most often for an instant infusion of beauty and joy. So it is with deep sadness that I am reading about the death of Allen Toussaint. I am not an expert on this legendary musician’s career, but I know enough to know that I was blessed to be among his listeners. I will leave the details and the more knowledgeable tributes to others. Here’s a New York Times remembrance. Here’s are two tracks from The Bright Mississippi.